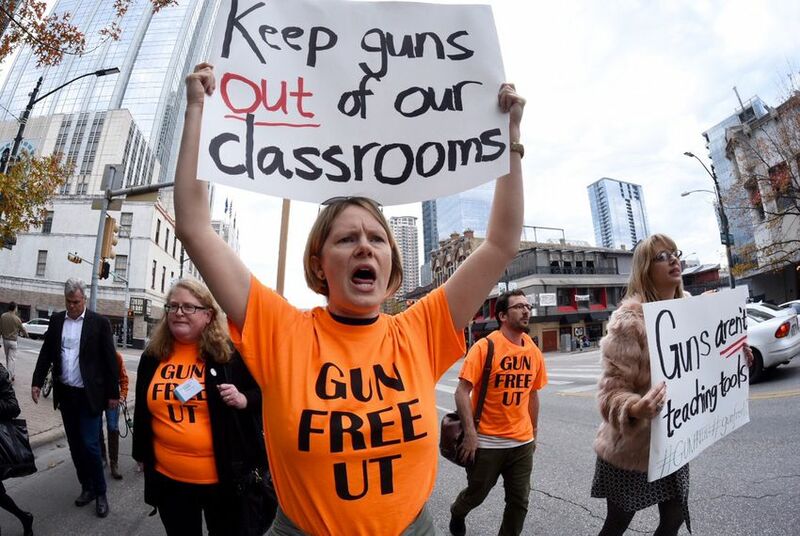 District Judge Lee Yeakel wrote in his decision that the professors — Jennifer Lynn Glass, Lisa Moore and Mia Carter — couldn't present any "concrete evidence to substantiate their fears" that campus carry would have a chilling effect on free speech. The professors claimed, among other arguments, that the law violated their First Amendment rights since the possibility of a gun being in their classrooms might make them hesitant to discuss controversial issues. In dismissing the suit, Yeakel said the professors didn't have standing to sue. But Renea Hicks, the attorney representing the three UT professors, said the specifics of the ruling leave the case's future uncertain. While Yeakel threw out the case entirely, he only addressed the question of a First Amendment violation and not the plaintiffs' other legal arguments. "We had other claims in the lawsuit beyond that — a Second Amendment claim, an equal protection claim. The order accompanying his dismissal doesn't seem to address those issues," Hicks said in an interview Friday. "So there's a bit of confusion on our part." "The court’s ruling today is the correct outcome," Paxton said. "The fact that a small group of professors dislike a law and speculate about a ‘chilling effect’ is hardly a valid basis to set the law aside." Campus carry became law in 2015, but didn't go into effect until Aug. 1, 2016. It stirred up widespread opposition among faculty and many students — especially on the UT-Austin campus. But so far, there have been no major incidents, and protests on campus have all but disappeared.